Juncker hopes that visa liberalisation will approved before the end of 2016. European Council President Donald Tusk and European Commission President Jean-Claude Juncker have confirmed that Ukraine has fulfilled all the conditions to obtain a visa-free regime with the EU. 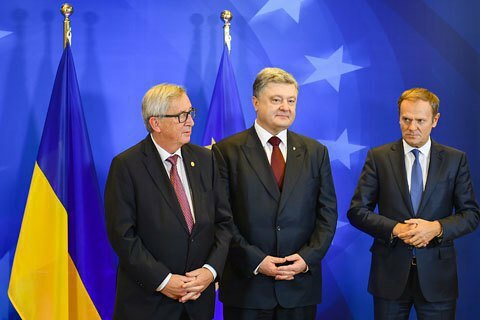 At a joint news conference after the EU-Ukraine summit on 24 November in Brussels, Juncker said that the European Commission continues to support the resolution in which it suggested that the European Council and the European Parliament should grant Ukrainians visa-free travel. "Ukraine has fulfilled all the requirements that we have set, and therefore the EU must now deliver on its commitments," he said. The head of the European Commission also expressed hope that this could be done by the end of 2016. "I'm happy because all EU member states agreed that Ukraine was ready for the visa-free regime. This decision is the recognition of Ukraine's achievements in the implementation of European standards," Tusk said. He also stressed that the decision would come into force as soon as the European Parliament and the European Council reach agreement on EU visa policy reform. "Now the case is solely about the development of a mechanism of suspension of the visa-free regime for third countries, which is being worked out by EU institutions... I would like to stress that this debate does not concern Ukraine, largely because Ukraine has implemented everything to perfection," said Tusk. Previously, the Ukrainian parliament called on the EU to abolish visas for Ukrainians, pointing out that Ukraine has fulfilled all the 144 requirements.